Definition Of One is one of the newest bands that I am working with through my partnership with Heady Entertainment. This up-and-coming, ambitious jamtronica act places an emphasis on live improvisation and stacking the stage with ecstatic energy. Definition Of One has just announced their return to Fat Tuesday’s in Fairfax, VA on Friday, November 13, and we are pleased to have Box Ezra, out of College Park, MD, supporting. Stay tuned to the event page HERE for details, updates and more! I am so pleased to be working closely with Definition Of One, and we’ve got some big goals and big plans for the near future. Check out the following live recording of their show from Doah Fest this summer, and get pumped for Def1! 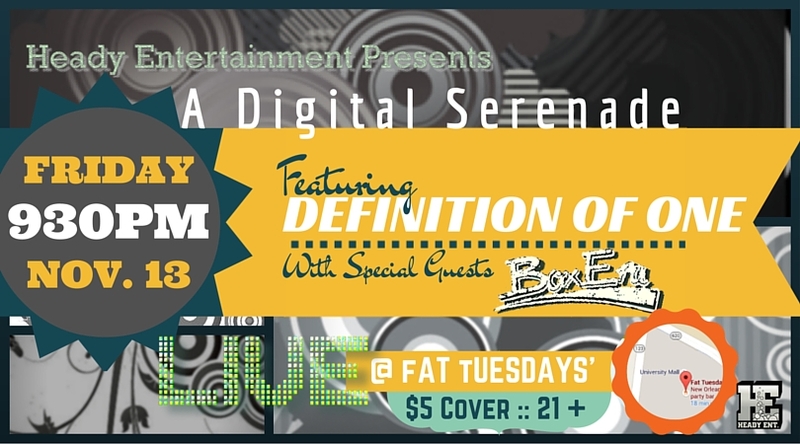 This entry was posted in Definition Of One, Gigs, Heady Entertainment, Just Announced and tagged Box Ezra, Concert, Def1, Definition Of One, Fairfax, Fat Tuesday's, Funk, Heady Entertainment, Jam, Jamband, Jamtronica, Live Music, NOVA, Rock, Rock & Roll, VA.